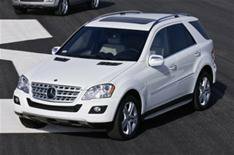 Mercedes revises M-Class - slightly | What Car? This is the revised Mercedes M-Class, which will go on sale this autumn. The most significant changes are with the car's safety systems. Pre-Safe, which primes the brakes and airbags, and pre-tensions the seatbelts if an imminent accident is sensed, will be fitted as standard, as will Neck-Pro, which moves the headrests to minimise whiplash injuries. Styling changes are minimal, with the most obvious being the new bumpers, headlights and front grille. Inside, the changes are similarly moderate, and include revised sports seats and the increased use of man-made leather. The engine range will remain the same, with 3.5- and 5.5-litre petrol units and 3.0-, 3.2- and 4.2-litre diesels ranging from 186bhp to 380bhp. However, Mercedes says engineers have reduced fuel consumption across the range by an average of 1.1mpg. The 500bhp ML63 AMG performance version of the car will also be revised, with more chrome detailing, new 20-inch alloy wheels and a new sports steering wheel. Prices for the revised M-Class have not been revealed, but are expected to begin at around 37,000.